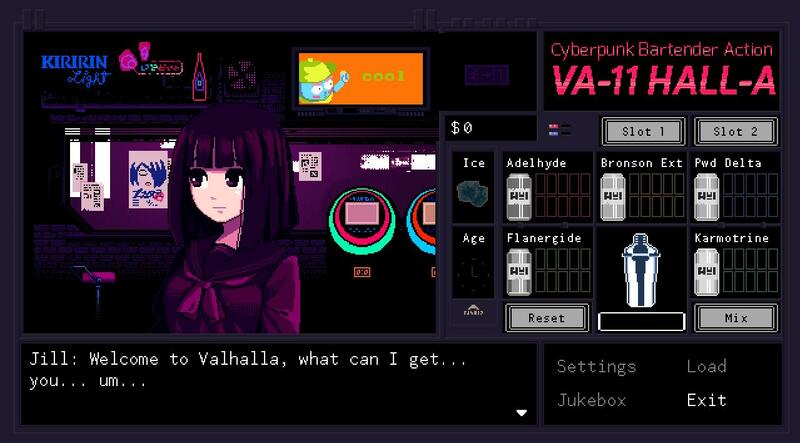 VA-11 HALL-A, a game developed by Sukeban Games, is set in a post-apocalyptic world where corporations have corrupted the government, implanting nanomachines in every human. The “non-powerful” are subjugated by the terrifying White Knights, ensuring everyone obeys the laws of this world. Daily life has been deluded to pointless pre-approved plans set by the powers that be. This is not a game about those people. *An example of the cutscenes which display dialogue, setting the exposition and storyline. 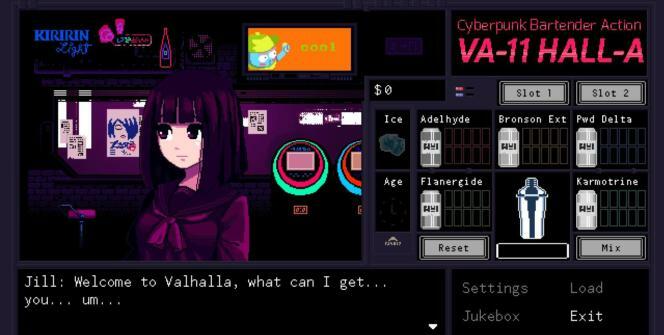 Your main character is known as Jill, a bartender at VA-11 HALL-A, affectionately nicknamed “Valhalla.” The main setting of this game operates within this bar, unlocking the dystopian storyline that lies underneath. It’s a concept that hasn’t been explored by any games I’m aware of, what better way to learn about this bleak futuristic world but through the eyes of the citizens experiencing it? *The interface for finding and mixing drinks, reminiscent of HUD systems like Pokémon. Once you’ve read through the introduction, you awaken inside this bar with no real instruction or direction to your tasks. My first playthrough resulted in failure of the first patron because I couldn’t mix the drinks correctly. It was a little frustrating to follow the directions given on screen just to read a negative reaction from the customer i’m trying to serve (and ultimately listen to, for the plot’s sake). Though this wouldn’t completely discourage me, it wasn’t a great playing experience to start with. 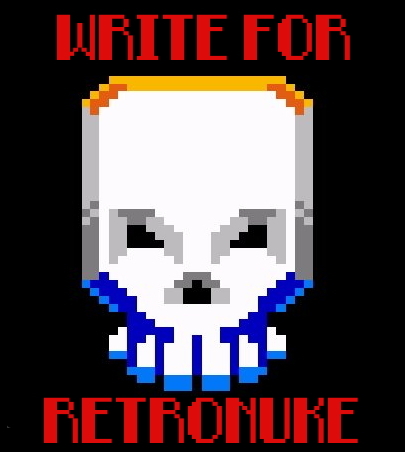 First and foremost, the design of this pixelated game is flawless. The graphics are detailed and display a not-so-uplifting future run by our corporate overlords.The bar stays dark and is spotted with neon-style signs that dive bars are typically known for. The pixelated graphics wouldn’t exactly count as retro, but the developers did a great job of creating their own art style. It’s easily one of the best features of the game. The music that plays while you read the unfolding plot is heavily synthed with a percussive bass line. It conveys the futuristic mood the game sets and changes with each new scene. I enjoyed it so much I left it playing while handling other activities on the computer. It’s a treat for the ears. Since I only played the demo of this game, I wasn’t able to learn be exposed to the immersive storyline as a whole. But given the way the dialogue handles itself within the first few minutes, this impression is easily made. I’m definitely going to get myself a full copy to experience the entire plotline. Unlocking of the storyline is done through successful serving of your drinks. As I mentioned earlier, this is reliant upon your personal skill. Although when I did follow the directions for the first drink, I was met with some criticism. I hadn’t done anything wrong from what I could infer, but my recipient wasn’t as convinced. *As you serve your patrons, expect reactions based on your skill. They won’t hold back. The demo shortly ended after this, as I failed yet again to make the drink correctly. Since I had to wait through a LOT of exposition and dialogue to reach this point, I opted to not try more than two more times. My impression of this game had already been made; it’s only the storyline I’ve yet to experience that will influence me in replaying VA-11 HALL-A for another attempt at keeping a bar. *The ending screen as the demo draws to it’s completion. Unlike Terraria or Rumpus, this demo left me more intrigued by the storyline rather than mechanics or gameplay. VA-11 HALL-A instantly captured my attention with the rich dialogue and intriguing method for delivery. The demo can be downloaded on the developer’s website or $15 gets you the full game. Serve some drinks and listen to the secrets hidden within this dystopic city. Have you played VA-11 HALL-A? Let us know what you thought of this cyberpunk bartender game/simulator in the comments section below!